There is mounting evidence that the condition of higher education grows more ominous. (Higher Education: Apocalypse Now?) One thing has become crystal clear — no more business or planning as usual. The Institute focuses upon the process of Future Proofing a Strategic Plan, detailing 10 vital planning initiatives required to prepare for the future to achieve fiscal and enrollment sustainability. Join us at one or more of our Institutes to more deeply explore critical issues facing higher education and strategies to address them. Strategic plans developed under a 20th century paradigm and context do not adequately prepare institutions for the realities of the emerging global digital learning ecosystem. As competition for enrollment increases, yield decreases, budgets tighten, and the outlook for higher education grows more perilous. Higher Education generally appears to be languishing in a static, moribund routine, perpetuating the past while a few focus upon inventing the future. The current fiscal/enrollment malaise is not just a cyclical downturn in students and funding driven by demographics and economic bad times (although these are certainly the case), but rather a permanent shift to learning in a new paradigm. Excuses and approaches bounce back and fourth between needing quick easy to implement ideas to stimulate enrollment, to firing people for not achieving enrollment, to being too busy to engineer a solid strategy and persist in its implementation, to just being too busy to do anything different. Failing approaches are generally myopic, underfunded, launched too late, or just ill conceived opinions of something that someone in authority believes should work. While we need not fly into oblivion on autopilot, I fear some will, based upon all too often refrains such as: “we can’t do that-politics-you know,” “show me a strategy guaranteed to work and I am all in,” “that is too complex, I need simple solutions that require no time, no budget, and no talent,” “we have decided to wait until the future is clearer so we are not on the bleeding edge.” For more see 50 Losing SEM Strategies. One always has the option of just sitting by and waiting for the tide of the future to wash them away. If that is not the chosen option, then we must move beyond the debilitating, nagging, internal dialog resisting the forces that are shaping the future and get on with it. Here are ten critical initiatives required to prepare for the future and acheive fiscal and enrollment sustainability. Let’s examine each of these in a little more detail. Many strategic plans fulfill the need for a plan but focus on a paradigm that is rapidly being overtaken by a digital reality. Such a strategic plan, built upon the old paradigm, can completely miss the entire point of having one. A strategic plan is an opportunity to visualize the future of the academic enterprise and set it on a course toward what will be. For this reason, we suggest a curriculum-centered strategic plan designed to inculcate a learner-centered curriculum. Looking to the future requires that a plan set a strategic course that recognizes and optimizes the paradigm shift to a global digital learning ecosystem. 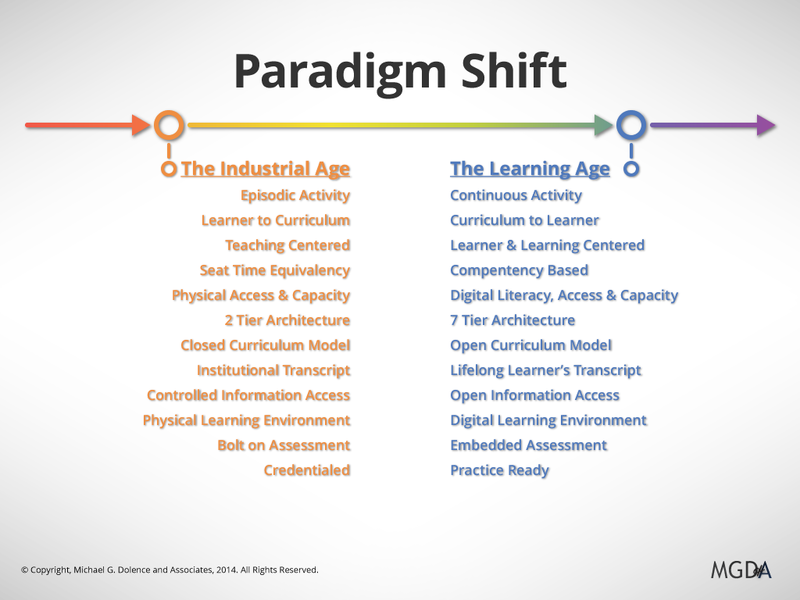 The new paradigm connects the curriculum to the learner rather than requiring the learner to come to the curriculum. This fundamental change in strategic relationships establishes new competitive rules, alters the scale of enrollments achievable in a course or program, eliminates geographic boundaries, and creates global markets. A strategic plan must deal with increased competition for students and resources, and the pressure to reduce the cost of a credential. It must advance strategies for institutional effectiveness as well as reference market awareness and alignment. These are huge challenges made more complex by campus politics and distracting calls to return to the last millennium and the ‘rules’ of that playing field. The plain fact is that higher education has never received adequate public funding and the shift in burden has been steadily to the learner. Some call that approach the house that student debt built, racking up a whopping $1.2 Trillion in students loans. So above all, a future proofed strategic plan must chart a course toward sustainability. The first step is to frame a prototype Learning Age Strategic Plan that helps visualize the pathway forward and articulate the various options. One option is to develop a rapid prototype strategic plan designed specifically for the 21st century as a preparatory and learning step to developing your strategic plan. The following graphic depicts a development model for constructing a prototype, much of which will form the strategic plan that follows. Recalibration of an academic culture of the magnitude required to align with the emerging global digital learning ecosystem, takes time. Time at this stage is in short supply and demands are growing more intense. A rapid prototype provides a means to rapidly run through scenarios that help remove the scariness from the future and get a sketch of what a future focused strategic plan looks like. Further, multiple scenarios can generate more than one prototype so various entities can follow their logic and ideas to a complete concept articulated in their prototype. A Prototype is just that and not a final plan so participants focus upon the scenario and not politics first. The result can be one or several competing prototypes that articulate different approaches and interpretations of the forces through an institutional lens. The graphic above depicts an approach we developed to illicit a framed prototype providing more detail of an approach. A great example of a pre strategic planning preparatory and learning process is captured in the Future of MIT report. Another great resource is The American Association of Community Colleges (AACC) 21st Century Commission’s report, Reclaiming the American Dream: Community Colleges and the Nation’s Future. As you examine these resources be aware the entire process is anchored in Mission and Vision. In order to future proof a strategic plan, serious attention must be given to academic strategies and that means the Academic Master Plan or as some prefer the Master Academic Plan. A revitalized AMP examines the scope of the curriculum, as well as program of study design models and emerging options for curriculum. The AMP should articulate a forward looking curriculum architecture that enables the institution to embrace the emerging global digital learning ecosystem, such as the seven tier proficiency based model. A future focused planning process assesses different curricula generas such as, scholar practitioner, community of practice, proficiency/competency/outcomes based, optimized core/GE, and all the permutations they engender. The AMP must provide meaningful assurance through curriculum, learning, and learner assessments. The assessment processes and the use of what is learned from them must be embedded in both the curriculum review/revision process and learner engagement strategies. Above all, the AMP must be developed as a holistic approach to the new learning paradigm. This means tempering politics with reason and a restoration of civility as academic options and approaches are identified, reviewed, discussed, adopted or rejected, adapted and implemented. In the end, it is the curriculum that determines sustainability. Even the best Academic Master Plan will under yield if the jagged rift between Academic Culture and Strategic Enrollment Management is not eliminated and a vibrant Academic SEM culture nurtured. That means that a quality curriculum must be informed by market realities and aligned with the tenets of academic excellence, public good and learner needs. Academic quality and demonstrable value are essential. The concept of perceived and real value must be understood, examined, and developed as a tool of recruitment and retention. New programmatic design models must be embraced as they emerge in a new paradigm. Academic programs and initiatives must connect inspirationally to the prospect’s decisions and choices. Deeper more connected programmatic narratives must emerge to undergird and advance institutional strategic position. In the process, the concept of geographic reach and service area must be reexamined and interpreted through a new, more global academic lens. Academics and SEM professionals must explore and optimize the social media tools and methods to engage potential enrollees. 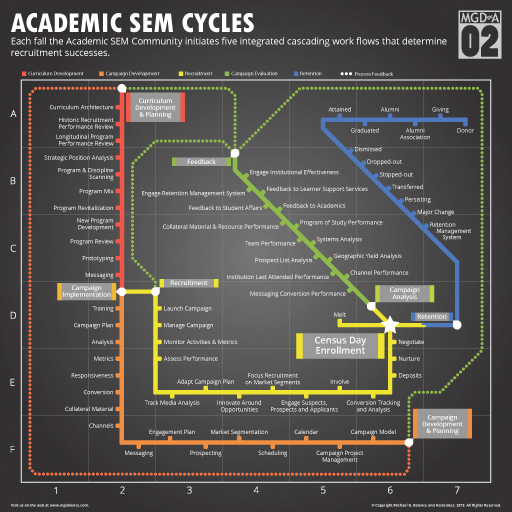 Academic SEM is, in fact, an approach that nurtures a community of scholars and practitioners engaged in extending institutional reach, strategic position and enrollment health. Understanding the complex cycles, interdependent timelines, integrated operational realities and managing them is an essential element of future proofing a strategic plan. Academic SEM initiatives are fed by two factors, academic program development/revitalization, and strategic positioning strategies. Planning is essential but it is fruitless without tangible Academic SEM initiatives. These two sometimes dispirit communities come together most tangibly in a recruitment campaign (paradoxically often the most under designed aspect of a recruitment program). This means that campaigns must translate academic value into terms that can be understood, that are inspirational, that connect to campus visits, and that illustrate student engagement and reveal outcomes. Campaigns must provoke interest, capture imagination, open a dialog, intrigue the viewer and engage the curious. New program launches are not just an academic triumph but a significant SEM campaign challenge that requires expert timing, careful preplanning, and meticulous attention to detail. Existing programs must also be positioned and that does not mean just marketing and promotion it means the systematic development of competitive narrative that compels interest and drives enrollment. Every aspect of the curriculum and academic life must be examined and considered for use in achieving a competitive position in the enrollment marketplace. Virtually every institution must take a critical look at their core/GE curriculum strategy. Given that it consumes 30% to 40% of the courses in an undergraduate program of study and accounts for 30% to 40% of the cost of an undergraduate credential, it must deliver value that is understood by students and their families. Contention is needless since the evidence is strong of the long term value but few tell the story well and even fewer optimize the design of their Core/GE for market value. Regardless of approach, core curriculum or distribution requirements, the basic tenets naturally align with core employability skills. One only need review What Work Requires of Schools (aka the SCAN Skills Report) commissioned by the U.S. Secretary of Labor to see the relationship between employability outcomes and those of foundational programs such as Core/GE curricula, co-curricular and first year experience programs. Design must enhance a narrative about the curriculum’s value. The narrative must describe and explain the value and the curriculum must deliver the outcomes required. 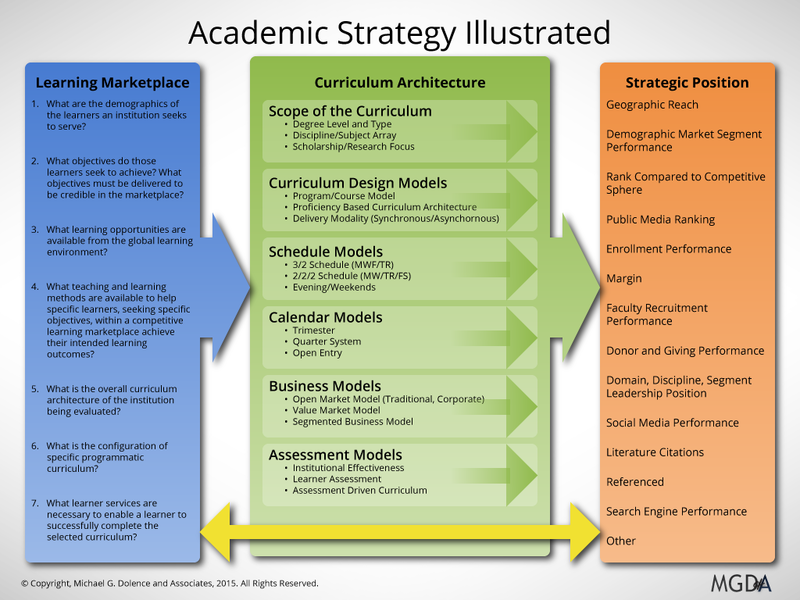 Strategic position is the term we use to sum the competitive position an academic entity has in a defined learning market. Strategic positioning requires a deep understanding of the emerging competitive market dynamics and institutional strengths and weaknesses with respect to attracting, enrolling, and retaining students. Strategic position is not branding, marketing, advertising or public relations, although all of these are tools used to help develop and sustain a strategic position. The impact of strategic positioning strategies are the result of research, analysis, campaign design and implementation efforts along six interrelated dimensions. Enhancing strategic position requires assessing where an institution is with respect to what prospective students are looking for in an educational opportunity and what other providers in its competitive sphere offer. The assessment of strategic position is informed through at least six lenses. The employment domains and discipline spheres lens examine the requirements of employers, contemporary realities in academic communities and the performance and success of alums. 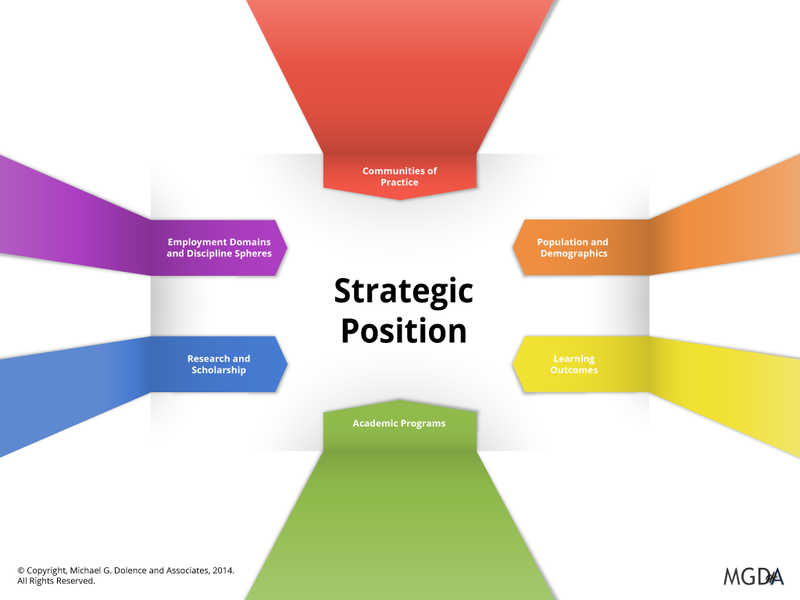 Strategic Position can be defined as the sum of the competitive characteristics an institution or program possesses when compared to other institutions or programs in the global learning sphere or its specific market segments. Optimizing resources means aligning the allocation of time, money, and human capital with the evolving challenges facing higher education. It means building capacity and managing strategic effort, and the creative development of resources to support the initiatives necessary to achieve the desired strategic position. Before one can optimize a resource one must first have it. This means the first step in optimizing requires assessing one’s strategic assets against future needs and challenges. The guiding principle in the process is found in the prototype strategic plan strategy (above) ‘Make Everything Count,’ toward the ultimate goal of sustainability. Inevitably this means making tradeoffs and it is here that many efforts fail. Success in optimizing resources means developing a keen sense of keeping things on the critical path forward and not letting artifact processes of the status quo derail the move forward. Capacity is defined by the resources available that align with and support the initiatives necessary to achieve the desired strategic position. Capacity includes knowledge, skills, systems, methods, organizational strengths, and time. Time means room in appropriate work plans, schedules and projects. Knowledge, skills and methods means we must invest in people and recognize that apprenticing in the old paradigm and acculturating to old memes is insufficient to meet the demands of the future. For example, after helping a client get budget approval for a social networking person we were disappointed to learn a road warrior had been hired instead crippling the social networking strategy. Developing capacity also means getting the most out of institutional systems. We have experienced decades of implementing sub optimized systems. Choosing to install or engage only the minimum required to get a system to work, leaving till later the realization of a system’s true potential. We have seen this sub optimized approach in every institution we have evaluated. Well, it’s later, and time to bite the bullet and drive toward true systems optimization. It is time to demand full systems implementation and full utilization of systems performance. Time to rectify bad decisions of the past and get on with getting the most out of the institution’s systems infrastructure. This does not mean just start implementing old or antiquated systems that were never optimized. It means take a fresh look, determine where optimization contributes to the critical path toward sustainability and move forward. Yes, a system and it must integrate with the management culture and operations, planning, and decision making. Too often these elements are ad-hoc and not connected. A checklist of words are evaluated to determine we have that and that. But in fact, they are just isolated elements that do not contribute to decisions and operations. When key elements are isolated and fragmented they give the illusion that the bases are covered, when in fact, they are not. Time to close the loop and make sure that the assessments that are conducted inform the decisions of the future. Finally, comes the accelerating the processes and pace of work. Work is a combination of effective asset and resource management, optimizing tools and systems and removing what gets in the way. I am frequently reminded by clients that a meetings culture in their institution gets in the way of their work. Attention to the amount of time administrators and staff spend in meetings is valuable discipline. Where it exists, a very serious effort must be made to restrain runaway meeting syndrome and reign in the unrestricted claim on work time allocated to meetings that do not contribute to sustainability. A colleague describes a meeting subculture in higher education that has led to individuals defining their role by the meetings they call, attend, and require with little or no attention to the unintended cost in unrealized goals. One of the biggest barriers to strategic planning success is that nothing happens because the plan or critical parts of it are not implemented. Room for the work must be carved out of the business as usual routine. Leaders who just keep heaping on items and expecting the human system to just continue to absorb the new demands have crippled many institutions. If willingness, ability, or understanding of the work to performed is the issue then that must be dealt with as well. This is a management function and in our experience poor management is an Achilles heal for higher education. Specifically, attention needs to be paid to strategic plan implementation. It requires more disciplined calendaring, time management, project management, resource allocation, and monitoring. Developing strategy is a delicate and reflective process. Six interactive framing concepts help to shape strategy in higher education. The SRS Method is designed to provide a point of reference for the discussion of the six concepts. 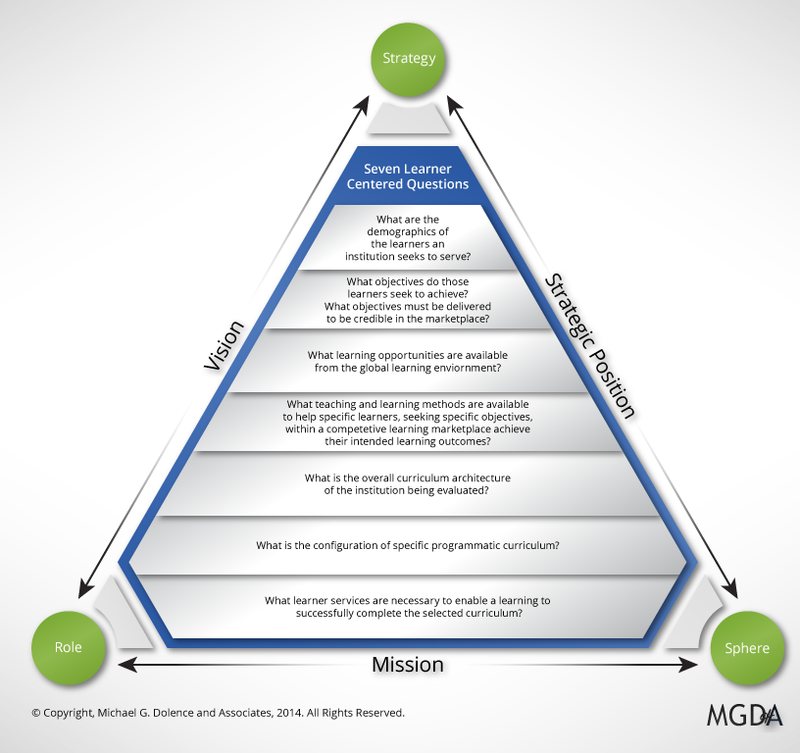 The SRS Pyramid depicts the schematic outlining a formal method for reviewing a mission statement and developing strategy in colleges and universities. The SRS Pyramid frames seven interactive constructs built around and reflective of mission that shape an institution’s vision, focus its strategies, and achieve its position in the broadest global learning sphere. The SRS Pyramid recognizes that mission defines the role of an Institution within its defined sphere of influence. It is designed to provide a common reference point for structured dialog regarding each of the seven concepts and the relationships they have to mission and its fulfillment. Dialogue begins with mission at the base of the pyramid and is directed right for a discussion of the Sphere of influence and left to illuminate the Role or roles played in that sphere or spheres. An institution’s or entity’s (school, college, department, program) sphere is defined by its geographic reach, competitive and collaborative contexts, and the communities of practice that influence or are influenced by the entity. The role of the entity – its purpose and function – within its sphere is defined by its mission. Environmental scanning and analysis (e.g., SWOT, GAP or other situational analyses) evaluate changes within the sphere for their impact on mission and role. As Sphere, Mission, and Role conditions and interactions are understood; strategists, planners, and constituents can invest in the creative process of determining a Vision for the future. Strategies are then developed to enable the vision. When implemented, the strategies modify and sustain an entity’s Strategic Position within its sphere of influence. In summary, Mission defines Sphere and Role, Vision relates Role to Strategy, Strategy redefines Strategic Position within and organizations Sphere of influence. The Sphere of an entity is defined by its geographic reach, competitive and collaborative organizations, subjects, disciplines, and communities of practice influenced by; and whose influence is exerted on the strategic entity. Each strategic entity is defined by its mission within a sphere that defines its role (purpose and function) within the sphere. Environmental scanning and analysis (often referred to as a SWOT Analysis for Strengths, Weaknesses, Opportunities, Threats) inform and evaluate changes within the sphere and how they impact mission and role. Environmental scanning without an analysis is a waste of time. Once the Sphere, Mission, Role conditions and interaction are understood strategists, planners and constituents invest in the creative process of determining a vision of the future in which strengths are sustained or enhanced, weaknesses are addressed, opportunities are capitalized on and threats are mitigated. Strategies are then developed to enable the entity to realize its vision. When implemented the strategies modify and sustain the entities strategic position in its sphere of influence. The Learner-Centered Curriculum Framework is a tool that helps frame strategic dialog and analysis around the principles and practices of the concept learner-centered academic environments. This article describes the seven learner-centered questions that emanate from the Learner-Centered Curriculum Framework and help frame a basic enrollment management perspective useful for strategic enrollment management professionals when they dialog with academics. 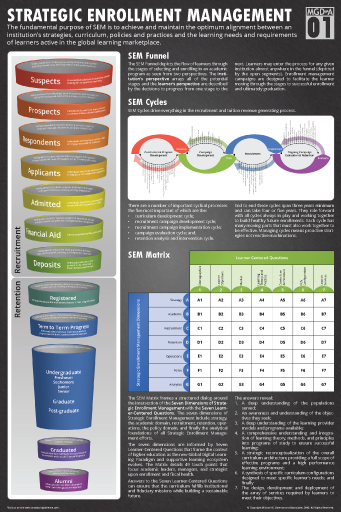 The table below can be printed and guide deeper insight into the options revealed through each question. The Curriculum-Centered Strategic Planning & Management Model (CCSPM) provides a framework for strategic planning in higher education. This video provides a brief overview of the Curriculum-Centered Strategic Planning & Management Model and its functions. 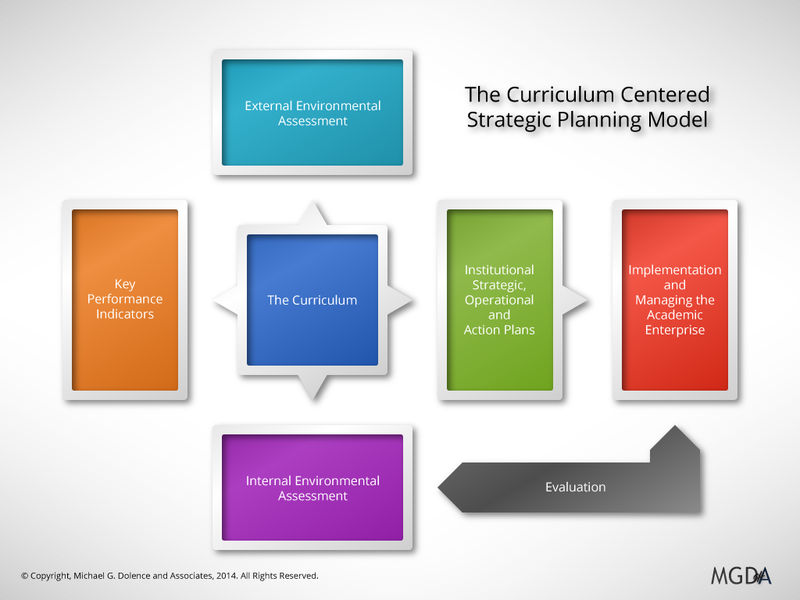 What is the Curriculum-Centered Strategic Planning & Management Model? The Curriculum-Centered Strategic Planning & Management Model is built specifically for higher education, and centers as the name suggests, on the curriculum. It is designed to import whatever planning has already occurred in an institution avoiding the unpleasant prospect of starting over. It integrates seamlessly with accreditation self-study processes, and if implemented in time, can become the core of the accreditation process. The Curriculum-Centered Strategic Planning & Management Model can also integrate academic program review into the overall institutional strategic planning initiative providing unprecedented cohesion between academic and institutional plans. The process is designed to run continuously, refreshing itself each cycle and providing an effective communications process resulting in clear understanding among the array of both internal and external institutional constituents. The Curriculum-Centered Strategic Planning & Management Model was designed and developed by Michael G. Dolence, President of Michael G. Dolence and Associates, a consulting firm serving higher education and the vendors and public policy entities that engage with it worldwide. 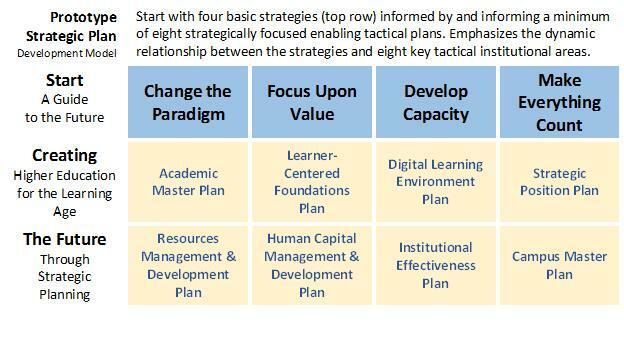 The Curriculum-Centered Strategic Planning & Management Model is the next generation of strategic planning model that evolved from the Strategic Decision Engine published in Working Toward Strategic Change (Jossey-Bass 1996). Faculty have steadily increased their use of Learner-Centered Pedagogies according to a comparison of faculty reported teaching and learning methods deployed in their classrooms. “The Undergraduate Teaching Faculty: The 2013-2014 HERI Faculty Survey,” a triennial national survey of college and university faculty has been conducted since 1989 by the Cooperative Institutional Research Program, by the Higher Education Research Institute at UCLA’s Graduate School of Education and Information Studies. The concept of Learner-Centered pedagogy has deep historic roots in the work of Dewey, Piaget, Rogers’ Gardner and Bloom (and many others) as well as the innovative models of Maria Montessori and the Reggio Emilia approach. Faculty in higher education have begun to adopt and adapt Learner-Centered pedagogies in such efforts as the flipped classroom and a host of in class and in course methods. The HERI Faculty Survey has been tracking progress in the use of these pedagogies since 1989-1990. 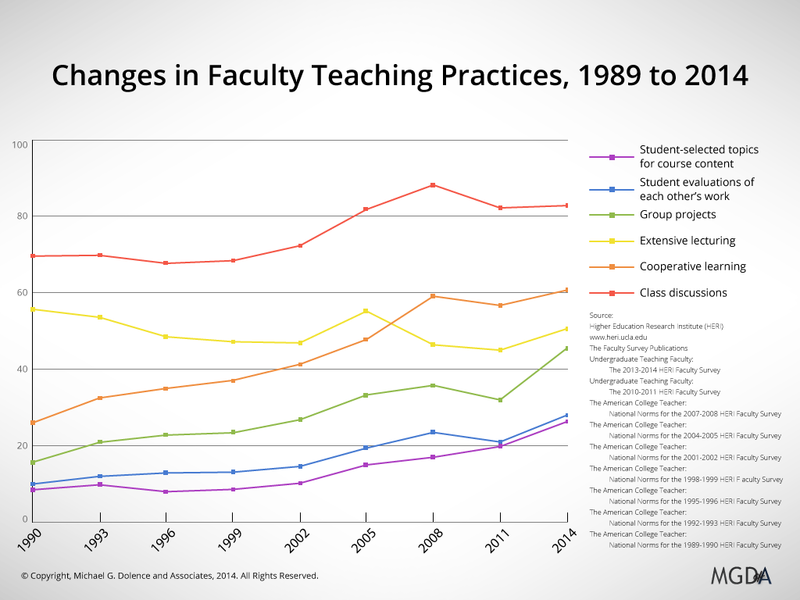 In 1989-90 69.6% of faculty reported using class discussions in “all” or “most” of their courses increasing to 88.2% in 2008 and leveling off at just over 82% in 2011 and 2014. In 1989-90 20.6% of faculty reported using cooperative learning strategies increasing to a peak of 73.2% in 2008-2009 and settling to 60.7% in 2013–2014. The use of group projects was reported by 15.7% in 1989-1990 growing to just under half (45.5%) in 2013-2014. The use student evaluations of each other’s work in “all” or “most” of their courses has nearly tripled from 10% in 1989–1990 to 28% in 2013–2014. Comparing the reported use of specific pedagogies over a period of fifteen years. While the advances in the use of learner-centered pedagogies maybe laudable, faculty efforts tell only part of the story of the transformation of the learning ecosystem. While faculty are engineering and re-engineering their curricula, courses, teaching and classroom instructional methods, students are busy optimizing their access to the emerging global digital learning ecosystem. These are not competing efforts but transformations on parallel development tracks and trajectories. They are neither integrated with each other nor cohesive in a unifying purposeful design but rather opportunistic initiatives. So where are the learners in their quest to nurture and support their own learning. Students tend not to classify technology as a learning approach but rather the use of digital tools to assist in their quest to master their course material. For students, the technology is largely taken for granted and not seen as either innovative nor at the expense of other methods and tools. Increasingly, being Learner-Centered means integrating the use of technology and the realities of the emerging Global Digital Learning Ecosystem into the curriculum and learner experiences. For a thorough understanding of the current technology status examine the Global Information Technology Report 2014. Technology access policies should ensure that speedy internet connections are available to prevent user issues when implementing digital learning. At-risk students benefit most from technology that is designed to promote high levels of interactivity and engagement with data and information in multiple forms. Curriculum and instructional plans should enable students to use technology to create content as well as to learn material. Policymakers and educators should plan for blended learning environments, characterized by significant levels of teacher support and opportunities for interactions among students, as companions to technology use. 96 Percent had taken traditional courses that included online elements. 79 Percent had handed in assignments online. 71 Percent had taken Web-based tests and quizzes. 67 Percent said they use technology at least every hour. 68 Percent said they saved two or more hours daily, and 14 percent said they saved at least five hours using technology in their learning process. 51 Percent said they were more likely to complete reading assignments on time if they used digital devices instead of print. 79 Percent searched for information on a mobile device immediately before an exam. 78 Percent said they had received updates from professors via learning management systems or student portals. 84 Percent said they had access to their class syllabi online. Learning is the point. Technology, as enabling and essential as it is, is not the point. Neither is ‘On-Line.’ Faculty, generally, are not Luddites, but rather careful explorers and experimenters searching for effective pedagogical practices. Technology innovations and their application by scholars, educators and innovators, to building a Global Digital Learning Ecosystem are enabling learners, to transform their educational experience. The industrial model of the 20th century, while an extraordinarily powerful system then, does not align with either the power of, nor the potential of, the new 21st century constantly and rapidly evolving Ecosystem. We cannot ‘fix’ this fundamental misalignment by enhancing the efficiency or effectiveness of existing models. The elements of a comprehensive and cohesive new academic model are emerging. Higher education leaders, scholars, and policy makers must come together to shape the educational systems of the future that optimize the Global Digital Learning Ecosystem and its impact on learning. In our continuing effort to support our clients managing the transitions through turbulent times, MGDA is offering a full schedule of Transformational Strategies Institutes for 2015. The curricula are focused on the development of academic strategies to cope with the rapid transitions and fundamental transformations now underway. The Paradigm Shift is real, presents extraordinary opportunities, has and will continue to lead institutions into crisis, and is believed to be a myth by a small and dwindling community. Regardless of whether you believe the current paradigm shift to a Global Digital Learning Ecosystem is a crisis, an opportunity, or a myth, the failure to recognize its impact and implications can be catastrophic for an institution. The Paradigm Shift has led to the dawn of the Learning Age. An age characterized by ubiquitous and persistent lifelong learning within, between, and throughout global cultures. For higher education, we already see a significant differentiation of the curriculum architecture serving the learning age versus that serving the industrial age summarized in Figure 1 below. No disrespect or pejorative context is intended or implied here. We depart the Industrial Age having optimized that paradigm for learning with extraordinary institutions of knowledge, research and learning and most important a dedicated cadre of talented researchers, teachers, scholars, and practitioners dedicated to advancing the human condition. A paradigm shift however, has little to do with the accomplishments of the past, it is built upon what is possible in the future given certain changes in conditions. Lets examine just three of the conditions that have changed that fuel the fires of the Learning Age. Ubiquitous digital communications and connectivity defines the first conditional change. The ability to openly connect to global populations instantaneously alters the human condition. This ability to connect changes human interactions and dynamics, establishes a global, cross cultural borderless society that superimposes over the existing geographic boundaries of nationalism. It opens the flow of data, information, opinion, images, narratives, beliefs and creative expressions to all with access. The dimension and utilization of the global digital communications infrastructure is staggering. The fundamental change involves infrastructure development, connectivity, capacity, and utilization. 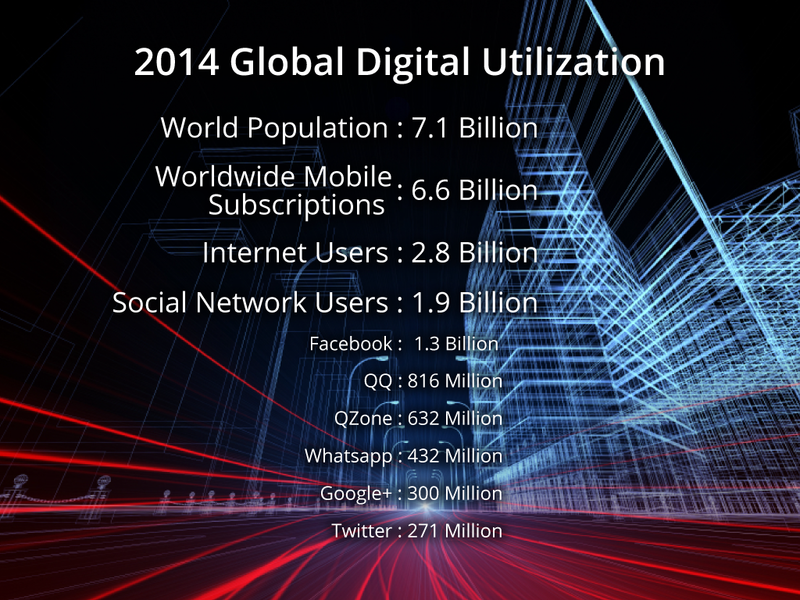 Figure 2: 2014 Global Digital Utilization. Global digital communications define the new learning ecosystem’s functional and operational parameters. Interpersonal communications channels, systems, platforms, and facilitators are rapidly evolving, providing a plethora of options upon which learning processes are built and enhanced. The Conversation Prism provides an excellent visualization of the ever evolving digital communications domain. 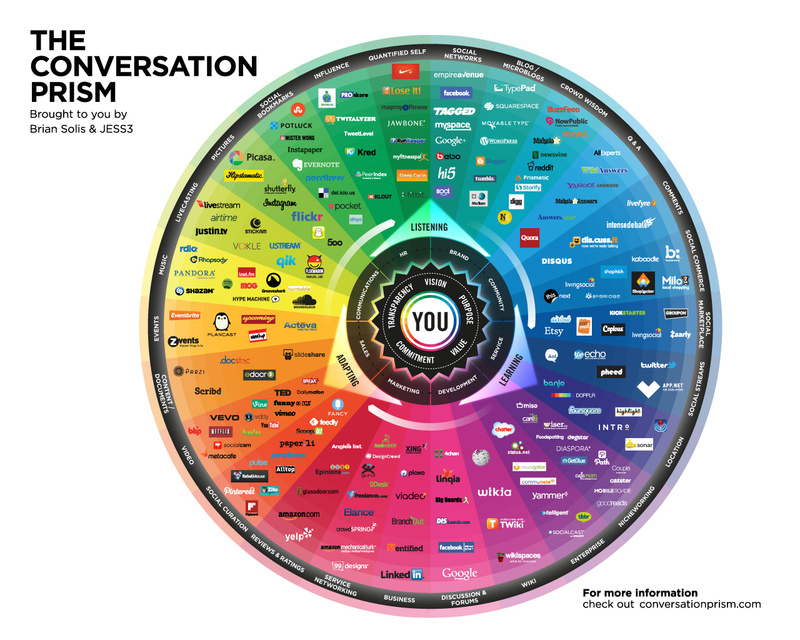 Figure 3: The Conversation Prism V4.0: Developed in 2008 by Brian Solis, The Conversation Prism is a visual map of the social media landscape. It’s an ongoing study in digital ethnography that tracks dominant and promising social networks and organizes them by how they’re used in everyday life. Ubiquitous digital communications provides the means to deliver copious amounts of content to individuals. The next condition rapidly evolving and driving disruption across learning and education systems is the extraordinary amount of information digitized, stored and available for open access. Figure 4: The Digital Universe. Basic knowledge media (the media by which knowledge and information is collected, stored, and accessed) has shifted from physical (primarily paper) to digital media. 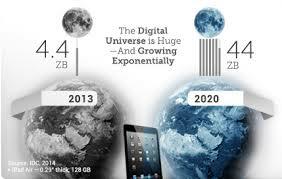 Collectively, the mass of data has been referred to as the digital universe. The shift in media from physical to digital expands access exponentially to the information required by individuals engaged in learning. When coupled with digital search, filter, share and cite capabilities, the impact is dramatic and the implications profound for learning architectures and systems. The impact might be more marginal if the sheer volume of the content were not so extraordinary. Online Reference Sites abound on the Internet. University of Texas at Austin is a handy compiled list to illustrate a profile of collected links leading to terabytes of indexed information. The vast repositories of data and information are accessed via and used by an ever expanding inventory of learning and creative tools learners are organizing into high performance learning and creativity environments. Teachers and faculty have recognized the value of digital learning and creative tools from the beginning. The Top 100 Tools for Learning 2014 published in the U.K. compiles the results of the 8th Annual Learning Tools Survey conducted by Jane Hart from the votes of 1,038 learning professionals from 61 countries worldwide and published on 22 September 2014. The digital learning landscape is rapidly evolving. The same digital paradigm shift is driving rapid evolutionary changes across all sectors of global society and no one is immune. There are numerous examples of institutions that understand the magnitude and implications of the shift. There has been a dramatic impact upon the academic and curricular elements in education. Start with MIT’s Open Courseware initiative now posting 2,150 courses and clocking 125 million visitors. MIT didn’t stop their visioning with OCW. I encourage you to visit the website and read the report of the Institute-wide Task Force on the Future of MIT Education. I also encourage you to examine the $7K Georgia Tech, Udacity, and AT&T online Master’s degree in Computer Science. The edX.org organization should be thoroughly examined taking note of the expanding list of partners. Coursera has a large scale course delivery system with over 10 million learners enrolled in 883 courses from 116 providers is an example of courses delivered on a massive scale. There are many more examples. These three fundamental characteristics of the emerging Global Digital Learning Ecosystem are paving the pathways to the Learning Age. As the dawn of the Learning Age sheds new light on the potential of a Global Digital Learning Ecosystem, education can be expected to pass through at least three stages of change. Disruptive change is characterized by two paradigms colliding abruptly. Fear, anger, disbelief, and resistance are natural reactions during this period of adjustment. Adaptive change is characterized by educators making use of the functionality of the digital environments but resisting substantive change to the system that controls and manages it. Optimized change constructs a new system around the new paradigm and the adaptive learning culture that it nurtures. New realities shape the need for validated credentials and new features and functions evolve within the emerging digitized learning environment. In the end, the new paradigm means rethinking the higher education model and that means rethinking all things academic. The bad news, there are any number of barriers to an institution rapidly evolving to accommodate and optimize the Global Digital Learning Ecosystem. The good news, there are significant options emerging and more under development that facilitate and enable institutions to adapt, and if done in time, flourish. There are, however, no simple solutions, proven pathways to clone or slam dunk approaches that guarantee success. Each educational entity (college, university, school, educational system, learning organization…) will move through each of these stages at their own pace. Some will not survive the economic and enrollment disruptions occurring in parallel as the new paradigm takes root. The perils of the shift are exacerbated by corresponding economic, demographic and political factors, frictions and conditions. 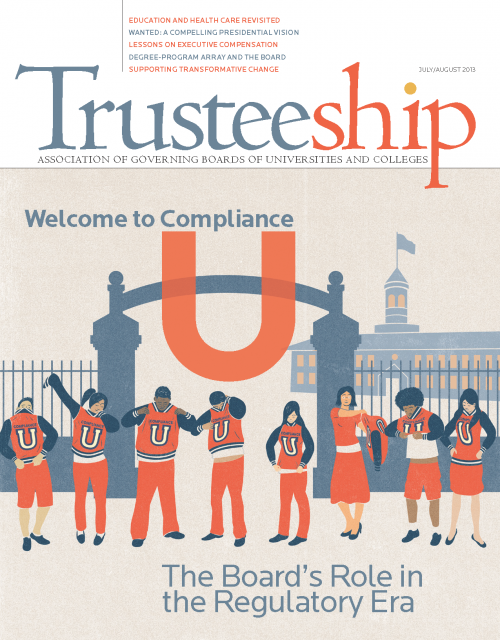 College and University trustees must recognize the need for dramatic realignment and learn to require, encourage and support institutions through the maze of decisions and options that must be confronted in order to flourish in the new paradigm. Because it is a fortunate institution who has a senior leadership team capable of navigating the turbulent waters of the paradigm shift, we must focus upon developing the human capacity to engage the future. Most, if not all, strategic plans in higher education must be recast to facilitate preparing an institution for the post paradigm shift future. The magnitude of impact and speed at which the emerging paradigm is developing, coupled with very significant trends directly effecting higher education, make a concerted effort to adapt extremely urgent. This is not to abandon the model we have but to rapidly adapt to emerging new conditions. That means a focus on developing an institution’s strategic position in a global learning market. MGD+A is currently posting a series in our blog titled Prototype a Learning Age Strategic Plan, to help focus institutional planning on the future. 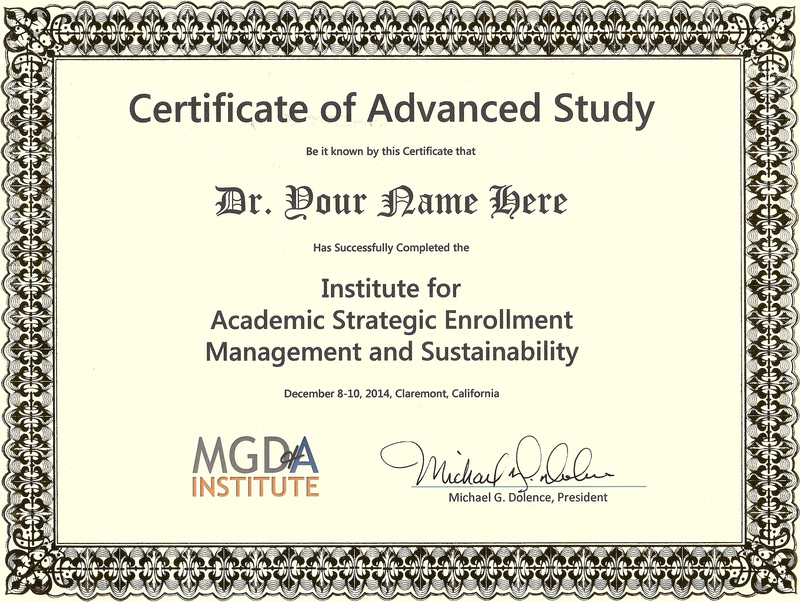 In February 2015, MGD+A will host an Institute on Academic Strategies and Master Academic Planning and in March 2015, MGD+A will be hosting an Institute on Curriculum-Centered Strategic Planning and the Learner-Centered Curriculum to address academic and institutional options and opportunities emerging from the new paradigm. MGDA began offering Institutes covering Transformational Strategies in 1998, shortly after publishing Transforming Higher Education. For 2015, we are planning five programs, all to be held in Claremont, California. Enrollment is limited to 40 participants in each event. All events will be held at the DoubleTree by Hilton Hotel Claremont, 555 W. Foothill Blvd. Claremont (Los Angeles Area), California 91711. Each Institute begins Monday afternoon permitting Saturday air travel and Wednesday departure helping to keep air travel costs contained. Los Angeles is served by five airports (LAX, SNA, BUR, ONT, LGB ). The Claremont location is central to Los Angeles area sites and attractions. Registration can be completed online and participants can either be invoiced in advance or register by credit card. The Institute for Academic Strategies and Master Academic Planning recognizes that academic leaders must plan to meet the challenges and opportunities of higher education as it is carried into the future by the paradigm shift to a global digital learning ecosystem. Without a Master Academic Plan, an Institutional Strategic Plan is powerless at forging near, mid, and long term strategies for enrollment and fiscal health. The Institute for Curriculum-Centered Strategic Planning & Learner-Centered Curriculum recognizes the centrality of the learner to the curriculum and the primacy of the curriculum to the institutional strategic plan. It also recognizes that planning for education in the learning age is supported by a global digital learning ecosystem. The planning horizon is characterized by increased demands for accountability, increased competition, significant learner and institutional economic challenges, and significant differences of opinion on how the future should be approached. The Institute for Academic Strategic Enrollment Management and Sustainability recognizes that academic leadership and enrollment management professionals must join forces in order to meet the challenges and opportunities of higher education as it is carried into the future by the paradigm shift to a global digital learning ecosystem. Once joined, they form a resilient and effective Academic SEM community of practice capable of forging near, mid, and long term strategies for enrollment and fiscal health. The Academic SEM Curriculum Development Workshop recognizes that enrollment performance and the quality of the curriculum can both be significantly enhanced when curriculum is prepared, aligned, reengineered, or tweaked with enrollment markets in mind. The workshop articulates methods to recalibrate fundamental curriculum design and content to better align with the enrollment marketplace. The workshop is designed to help academics and enrollment managers to better position curriculum and programs of study in the complex global learning marketplace and improving enrollment performance.